I just read two of the plays in this book for my British Drama class so I’m just commenting on those two, Everyman and The Second Shepherds’ Play. Medieval drama is not something I was completely familiar with though I knew a few of the conventions. These are two really interesting examples of the genre. 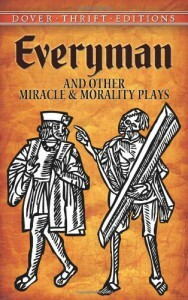 Everyman is a morality play and The Second Shepherd’s Play is a miracle play. Everyman is the story of a man who’s been called to give his account to God and he’s not ready. He wants more time. When Death comes to deliver the message, he realizes there is no more time. He starts asking various people if they will go with him on this journey. This is an allegory so the people are actually things like Fellowship, Kindred and Goods. None of them are willing to go with him to meet God. He asks his Good-Deeds to go with him and this ends up being the only one that goes all the way to the end with him. Knowledge stays a while and so do a couple of his other traits but in the end, only Good-Deeds goes all the way. It’s definitely a way to teach the audience some good Catholic doctrine and there was a plug for how wonderful the priests were, probably coming at a time when some of the corruption in the church was starting to come to light. A play like this is so enjoyable for a modern audience whether they are religious or not. It’s just a really clever, thought-provoking piece of writing. The Second Shepherds’ Play is a miracle play. It’s part of the cycle of Bible stories that were presented at festivals. It deals with the shepherds out watching their flocks when a fellow they know stops by to visit. They know him to be dishonest but they let him stay if he will sleep in the middle of them. He still manages to steal one of their sheep and take it home to his wife. When the shepherds come looking, he and his wife conspire to hide the sheep in a crib and pretend it’s a new baby. Much hilarity ensures. I mean that truthfully, not sarcastically. In the end, the shepherds find out the truth and do not punish the thief to the degree they could have. When they return to the fields, they are met by the angels who tell them of the Saviour’s birth and they make their way to Bethlehem. There are so many parallels and contrasts between the first part of the story and the second part of the story that it’s just fun to discuss and think about. Medieval drama will never be my love but it’s pretty cool once in a while.